Fire up their imaginations and senses with these personalized fire department magnets 5.125 x 1.9 fire truck shape full color – 20 Mil. This magnet grabs attention with its shape reminding a fire truck and full color imprinting offers great visibility to business information imprinted against it. This magnet easily becomes a value builder for emergency services, fire department and others involved in serving people at the time of distress. Attractive price benefits can be sought on bulk ordering these magnets from us. 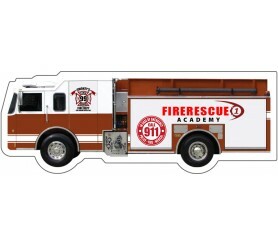 Request a quote to know discounts that you can avail on bulk ordering these custom fire department magnets 5.125 x 1.9 fire truck shape full color – 20 Mil. Additional Information – This price is inclusive of printing in full-color (four color process) on one side. Pantone® color match not available in full-color. Not made for outdoor use. Write-on/Wipe-off surface not available. Product Size: 5.125 in. x 1.9 in.